Honda Motors started developing a 50cc moped in 1956, launched in 1958 as the Cub / Super Cub model, a range which has remained in production ever since. 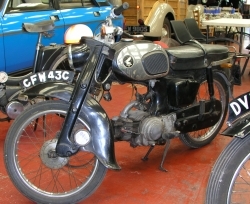 The 87 cc Pushrod Honda C 200 model was added to the range in 1964 and produced until 1967. An overhead-valve engine of 86.7cc produces 6.5bhp at 8,000rpm. The C 200's barrel and head were made of cast iron rather than the light alloy used for the 50cc models. 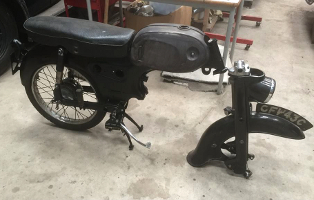 Other features include a pressed steel spine frame with swinging-arm rear suspension and leading-link front fork. This moped was first registered in April 1965 and its last owner was Mr Alan Robinson of Gainsborough. A Museum resident for many years, it is currently undergoing a re-build.